In the words of Pitbull, "They can't, they won't, they never will, stop the party." Sounds like the mantra for Grammys night. Once again, music's big night could be heard around the world as the industry's brightest stars gathered at the Staples Center in Los Angeles to celebrate what they do best. Childish Gambino and Kacey Musgraves led the pack of winners this year with four statues each while Cardi Bmade history at the 2019 Grammys as the first female solo winner to take home Best Rap Album on her first win. Lady Gaga used her victory as a chance highlight mental health at the microphone and Michelle Obama wowed the crowd with a surprise appearance. Plus, the show paid special tribute to icon Dolly Parton, Diana Ross and the late icon Aretha Franklinalong with a commemoration of Motown—and those were just some of the dozens of performances that filled the stage throughout the jam-packed night. Needless to say, it was quite the award show and there was plenty of reason to keep the celebration going once it was time for the show to sign off. You can bet the stars did just that. After changing out of their designer duds and into cool ensembles worthy of the after-party scene, they headed out into the city to party at the hot spots. Over at the Republic Records Grammys after-party, sponsored by Fiji Water, famous faces like engaged stars Sophie Turner and Joe Jonas could be seen having a great time. According to a source, the two were "the life of the party" as they danced and mingled with friends. Dance pros Derek Hough and Mark Ballasimpressed party guests with their moves on the dance floor while music legend Stevie Wonder hung out with friends at a table. Over at the Universal Music Group Grammys after-party, icons like Mick Jaggerand Earth, Wind & Fire were in attendance as were some of the night's winners, such as Musgraves with her husband Ruston Kelly. Exes Niall Horan and Hailee Steinfeld both attended, though it didn't seem like they crossed paths, according to a source. 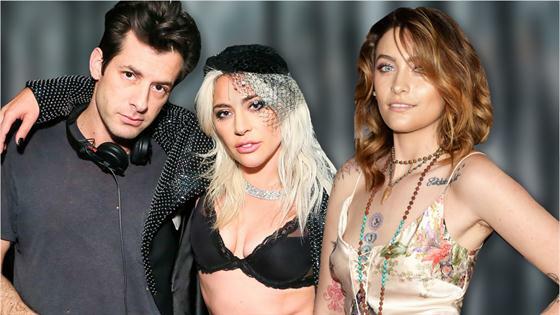 Meanwhile, at his own after-party, Mark Ronson and his fellow "Shallow" songwriter Lady Gaga celebrated their Grammy win by rocking out behind the DJ booth. Needless to say, it was an unforgettable night in Tinseltown for music's most beloved. Check out E! 's gallery below to see inside some of this year's after-parties. The "Shallow" songwriters celebrated their Grammy win at his after-party. The engaged lovebirds shared a laugh inside the Republic Records Grammy after-party. Michael Jackson's firstborn and her beau posed for photographers. The musical stars gathered for a group photo at Ronson's after-party. The newlyweds looked fashion forward as they stepped out at an after-party together. The sister duo posed for a photo with the "Gravity" crooner. The ballroom pro rocked a black suit accented with a stripe for his after-party look. The actress got glam for Universal Music Group's Grammys after-party. The Shadowhunters star opted for a chic white jumpsuit for her post-Grammys celebrations. The two singers posed for the cameras with drinks in hand. The Pretty Little Liars alum stepped out in a head-to-toe strappy black look. The singer-songwriters were all smiles at Universal Music Group's after-party. The stars and record executives smiled for the cameras all together. The two-time Grammy nominee rocked a white slip dress that highlighted her arm body ink. The music legend and record producer shared a laugh inside the Republic Records Grammy after-party. The songstress rocked a two-piece look with a sheer overlay inside an after-party. The Grammy winner took a seat in a vibrant red look. The world-famous DJ posed with a peace sign. The two stars posed for the cameras in their leather looks. The first-time Grammy winner kept her after-party look cool in a pair of metallic pants and fur bomber jacket. The Disney alum smiled for cameras inside a party. The trio smiled for the cameras inside a party. Now, let the countdown to next year's Grammys officially commence!